Barbara Bentley, Hope, ME, was a founding member of Friends of Baxter State Park and served as a volunteer in the organization’s formative stages – first as Membership Manager, then as Administrative Manager 2004 – 2005, becoming Newsletter Editor in 2005. Joining the Board in 2007, she then served as President and Newsletter Editor until her retirement in 2013, when the organization’s first Executive Director was hired. Her enthusiasm for the outdoors and long relationship with the Park fostered the rapid growth of the Friends’ organization and greatly expanded the number of ways it carries out its important mission. Working with individuals and groups from varied walks of life, from all areas of Maine and beyond, strengthened her conviction that the restorative power of wilderness is essential to all people and that Maine’s own wilderness is worthy of all the support we can muster. Barbara grew up in Bangor, ME. A graduate of Middlebury College, BA ’67, MA ’68, , MA ’87, she taught language and literature in French, Spanish, and English for 30 years. Barbara spent the summers of her youth at a wilderness trip camp at the foot of Katahdin in an era when canoeing down rivers full of pulp logs and rock climbing in the Chimney were standard outings and when wielding an ax was a required skill for girls. With her family, she continues the annual tradition of spending a week in the Baxter State Park’s interior. 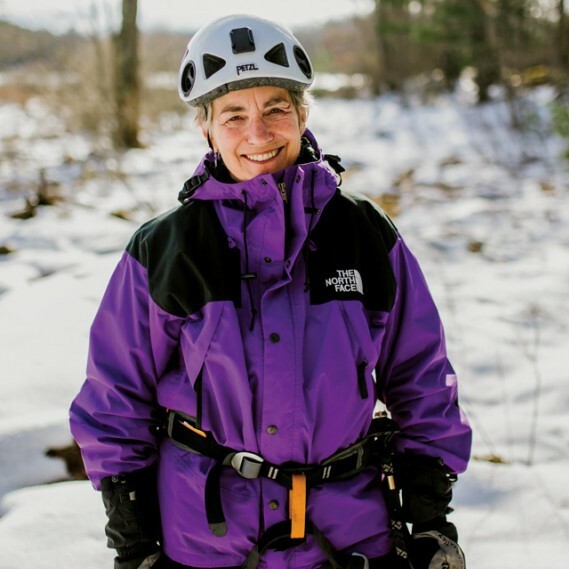 Barbara knows the Park well, having witnessed its evolution over the years as a wilderness in recovery, and now enjoys exploring the wilderness in Katahdin Woods and Waters National Monument. For the last 25 years, Barbara has lived in the Town of Hope with her husband Bill Bentley where they tend their acreage on Mansfield Pond, now under conservation easement as wildlife habitat with the Georges River Land Trust. She is currently working as a fabric artist, using the medium in multiple ways. The Bentleys hit the trail and head for the backcountry in all seasons, paddle the waterways, and ski and snowshoe when the world is white, usually accompanied by their Portuguese Water Dog Davis Pond, whose energy knows no bounds.